The youtubebulkviews.com web design is very colorful. We will note the design favorably: the site is designed in a very user-friendly way, and you can easily reach any requested page. The header is pinned to the top of the page so you don't have to scroll up and down to reach the different menus while navigating your way through the site. It's colorful, not very messy and everything is written very clearly. This seller offers prices ranging from average to high. 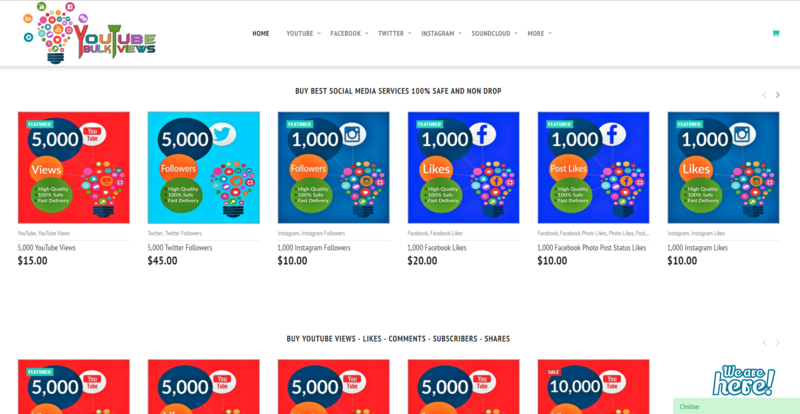 The price of YouTube subscribers is very expensive compared to other YouTube providers' sites. The price of YouTube views, on the other hand, is an average price and is similar to other sites. The price of comments is average too, and the price of YouTube likes is high. youtubebulkviews.com accepts various payment methods to cater to most preferences: you can pay via PayPal, BitCoin, BitCash, LiteCoin, Dash, DogeCoin, Payeer, Credit or Debit card. The site doesn't feature a section dedicated to their refund policy and we had to "dig through" the TOS in order to find it, and the terms are written in a very legal manner, which might confuse the average consumer. We also received the rest of the orders very quickly. Our biggest problem with them is that they don't deliver the orders gradually so it is obvious that all the YouTube services are generated by robots which clearly goes against YouTube's TOS and might get your account permanently deleted or temporarily suspended. Unfortunately, we have nothing positive to say here, as well. We've experienced drops in every YouTube service that we've tried from them. Their support team did not refill our views until we informed them we were writing this review. We waited for a response from the support team for an entire week! We expected much better treatment. The support team's answers did not match any of our questions, and it seemed as if the answers were copied and pasted, regardless of what we wrote. youtubebulkviews.com's quality of service is very low and their manner of operating and handling customers is sketchy and uncomfortable, to say the least. You can contact the support team easily through the site, and on each page of YouTube service packages you can also read about the service in question. In our opinion, it is not sufficiently registered and there should be a page dedicated entirely for questions and answers. You can also contact them via a chat window. Youtubebulkviews.com's final score will be 40/100. The 40 goes for the web design and for the decent prices only. Even though the site is quite clear, their services are very poor, have serious drops and customer service completely ignored our request for a refill or refund. Our suggestion for them will be to add FAQs and improve their delivery and customer service quality.